This one-day trip to the crescent-shaped Ochsenbauch Bay is combined with a festive final restaurant visit in the evening. 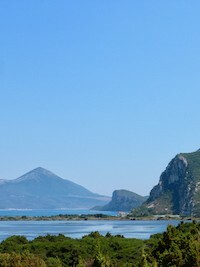 It is a spectacular surrounding on the Peloponnese with a fine sandy beach. The sides of the bay are closed by two high rocks through which the sea water has paved a way. We will visit Nestor’s Cave, from where you have a fantastic view. This one-day trip to the Polylimnio Waterfalls near Kazarma is a very special experience for most of the participants. in this enchanting landscape and will use our senses to connect more deeply with our innermost core. This natural paradise touches a natural long-forgotten liveliness in us.